At the Ronald Reagan Library, the would-be veep describes Trump as a new version of the 40th president, risking a blasphemy charge. In the eyes of many #NeverTrump conservatives, Mike Pence committed blasphemy at the Ronald Reagan Library today. With malice aforethought, he delivered a speech comparing his running mate again and again to the 40th president, a semi-divine figure on the Right. In Pence’s account, 2016 became 1980 redux. Now as then, a rough-hewn former entertainer mocked by the “smart set” came forward with “blunt” talk and attracted a huge movement of Republicans, independents, and particularly Democrats, determined to pare back government, rebuild the military, unleash businesses, get the oil wells pumping and the coal mines humming, and Make America Great Again. 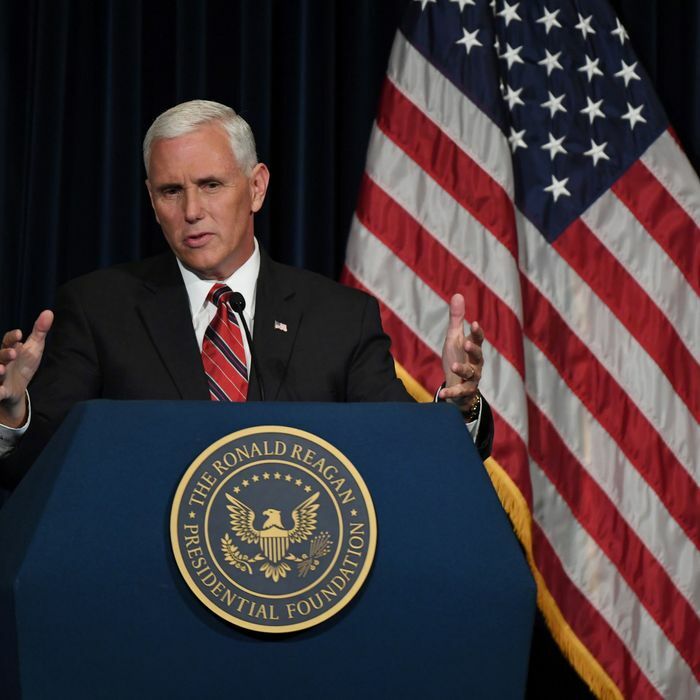 Listening to Pence, you could almost buy the parallels, putting aside little problems like Reagan’s devotion to free trade, Trump’s odd infatuation with Russia’s dictator, Reagan’s preparation for the presidency in two terms as governor of the nation’s largest state, and most of all, the massive contrast between Trump’s dark and dystopian outlook and Reagan’s sunny optimism. But then the Hoosier governor went too far, describing the “fundamental similarity of the two men” as being rooted in their common “honesty and toughness.” That was the first of six references to Trump’s honesty or truthfulness. Coming the morning after the mogul lied through his teeth about his original positions on the Iraq War and the military intervention in Libya, it’s amazing Pence was not struck by lightning — if not during his paeans to Trump’s honesty then during his claim that the great narcissist is a man of deep humility. It’s the trope on Trump: He’s authentic, a straight-talker, less scripted than traditional politicians. That’s because Donald Trump doesn’t let facts slow him down. Bending the truth or being unhampered by accuracy is a strategy he has followed for years. If, as Pence said today, “honesty is the axis on which leadership spins,” Trump is the unlikeliest national leader you could imagine. And while the audience in Simi Valley, California, cheered this peculiar characterization of Trump as the “new Reagan,” it is pretty likely that a lot of faithful followers of the Gipper reacted with emotions ranging from disorientation to fury — or simply closed their ears to the blasphemy.